As well as a variety of signage, we also worked a lot with vehicle livery/graphics in 2018. Vehicle graphics can be used in many ways, whether it be to decorate a vehicle, use the vehicle as advertising space, or even to change the colour of a vehicle by using conformable vehicle wrap. 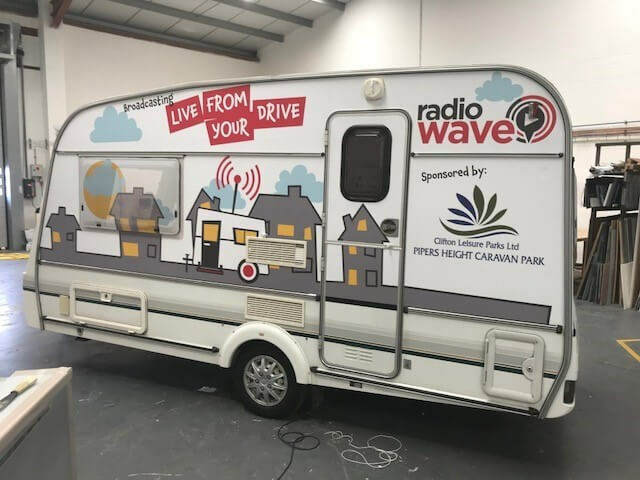 Vehicle graphics were used on this trailer, owned by Radio Wave, to promote and advertise their radio station while on the go. Mick’s Auto Repairs required a new image for their ‘muscle car’. It involved applying bright yellow stripes along the centre of the Ford Mustang. The stripes were made from a conformable vinyl, which allowed us to completely mould the vinyl to the shape of the vehicle. Booth Dispensers Ltd have used us for a number of years to livery their vehicles. This vehicle is completed with branding work, which advertises the business around the Fylde Coast. One of the main qualities of this job, is the use of the ‘Booth’ company colours and house style, which helps maintain the professional image of the company.